KOMAREK roll briquetter machines are designed to turn fine particles or residues into hard, dense briquettes of a specific shape and size. Turning steel mill residues into a form that can be easily reintroduced into the steel making process. Creating a specifically-sized/shaped product for end uses like easily dissolvable water softener pellets or slow-burning charcoal briquettes. Combining elements to make a new product. Improving handling of fine materials. Forming minerals, metal oxides and metal alloys/powders into easy-to-store products. Streamlining clean-up of manufacturing waste, including fine dust particles. With over a century of experience, KOMAREK draws upon our specialized knowledge to advise or assist your company in the design of a complete briquetting or compacting system. In most cases, we can suggest or supply additional ancillary equipment related to the briquetting machine. KOMAREK has pioneered many briquetting industry firsts, including cantilevered removeable rolls that reduce and streamline replacement time. 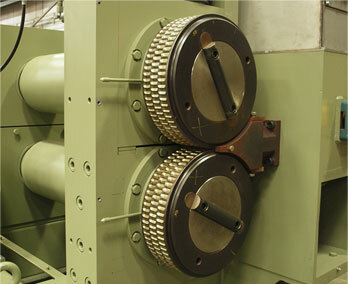 Roll briquette machines use moderate-to-high pressure to turn fine powders and granules into briquettes. However, with certain materials, binders – additives that help retain a briquette shape – are added. Chat with a KOMAREK expert about determining the right briquette shape, size and application for your material handling needs.